Yet while the president has been promoting himself through a public-relations campaign abroad, he has ratcheted up the suppression of critical voices within his own country. In Freedom House’s recently released report Freedom of the Press 2014, Ecuador was rated Not Free for the second consecutive year. And as the report suggests, the developments over the past year were more disturbing than just a continuing negative trend. Correa went to great lengths to silence his detractors in 2013, passing one of the region’s most restrictive media laws, ordering an illegal raid on a journalist’s home to steal potentially critical information, and rigorously policing social media to weed out citizen criticism. Importantly, he also diversified his targets, frequently seeking to silence or discredit the very groups that he correctly acknowledged in his opinion piece as having traditionally been “disaffected and disenfranchised.” His actions over the past year revealed the contradictions underlying his theoretically inclusive “citizen revolution” and provided a startling glimpse of what is likely to come. Among the most worrying incidents occurred on December 26, 2013, when Ecuadorian security forces, upon receiving an “urgent action” document from Correa’s general counsel, raided the home of journalist Fernando Villavicencio. Twelve police officials confiscated computers and documents in an apparent effort to undermine Villavicencio’s investigation into government corruption in the oil industry. That same night, state forces broke into the office of National Assembly member Cléver Jiménez, seizing two computers. Both Jiménez and Villavicencio were previous targets of the government, having been sentenced in April 2013 to 18 months in prison for alleged defamation of the president. They were free pending an appeal at the time of the raids. In a public address, Correa acknowledged that he had ordered the raids, claiming that he had done so because Villavicencio and Jiménez had hacked his e-mail and disclosed “illegally intercepted” documents. Two days later, cartoonist Xavier Bonilla, better known as “Bonil,” published a cartoon that satirically depicted the raid of Villavicencio’s home. In response, Correa accused him of lying about the incident and called upon the Superintendency of Information and Communication, a regulatory body created under the recently passed Communications Law, to investigate the case. The superintendent fined the newspaper El Universo for publishing the cartoon, and gave Bonil 72 hours to “correct” the drawing’s inaccuracies. Increasingly, the government’s persecution of critics has extended beyond prominent public figures to average citizens. In April 2013, Correa called on the National Secretariat of Intelligence to investigate a Twitter user who criticized him on the microblogging service, declaring, “While I am president, I won’t tolerate insults.” In a number of cases, the government has blocked access to content it deems unfavorable, including a documentary that depicted the environmental effects of natural-resource extraction on the indigenous Intag community and the harassment the community has faced from government officials for bringing its concerns to light. The documentary was removed from YouTube and private blogs by Ares Rights, a Spanish firm that polices social-media sites on behalf of the Ecuadorian government. Officials offered the ludicrous justification that the documentary had violated copyright laws by showing excerpts from Correa’s public speeches. The most notable trend in 2013 may have been Correa’s efforts to silence indigenous populations and other historically marginalized groups, many of which were part of the popular movement that brought him to power in 2007. In August, Correa decided to scrap the Yasuní ITT Initiative, an ambitious effort to preserve Yasuní National Park in the Amazon rainforest by raising funds from international donors to make up for the oil revenues that would be collected if the area were exploited. His unilateral decision, which effectively opened Yasuní to oil extraction, drew condemnation from media outlets, civil society organizations, and the region’s indigenous populations, who alleged that it violated a number of international human rights conventions as well as Ecuador’s own constitution. Indigenous and environmentalist groups immediately organized protests in Quito, Cuenca, and other major cities. Attempting to discredit the protesters, Correa called them violent extremists seeking to destabilize the government. His interior minister, José Serrano, took aim at three newspapers that had published firsthand accounts from protest witnesses who alleged that they were shot with rubber bullets and teargased by police officers. Serrano ordered them to correct their stories within 24 hours or face punishment. Three months later, the Environment Ministry shut down the indigenous and environmental rights organization Pachamama, which had protested against a number of government decisions regarding oil-extraction projects, including Yasuní. According to the ministry, the organization was dissolved for “diverging from its legally established objectives” and “meddling in public affairs,” as outlined under the recently issued Decree 16. Correa’s demonization of these former supporters shows that his commitment to the inclusion of marginalized groups is fully contingent on their political loyalty. Like Vargas, Correa is an astute communicator, but the more he stifles critical voices at home, the less credible his message becomes. 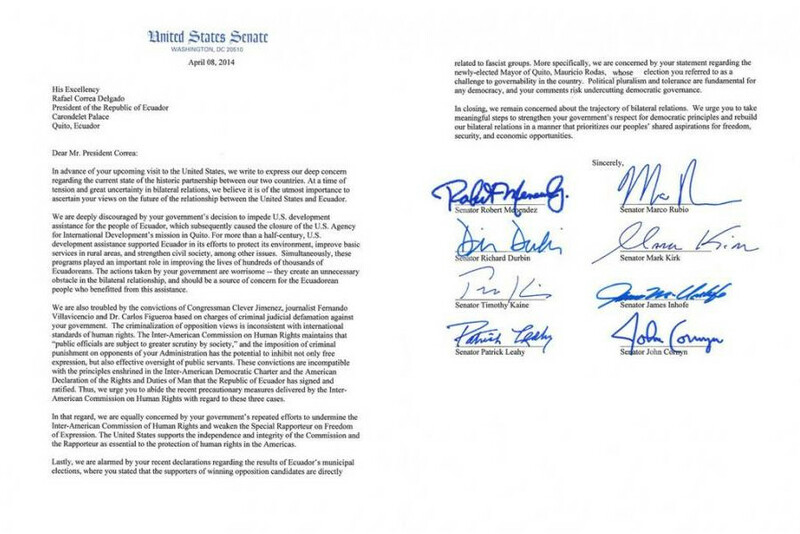 While the president clearly cares about his image abroad, he is naïve in thinking that op-eds and speeches will change many minds, such as those of the eight U.S. senators who wrote him a letter last month to express their profound concern about Ecuador’s trajectory. Correa should do himself and his country a favor by finally accepting that the only way to quiet his foreign critics is to stop silencing his domestic ones.